If you were the new showrunner of television's most talked about show of 2018, what would you do to make a good first impression for the second season premiere? In the case of mega-hit Killing Eve, new showrunner Emerald Fennell does exactly the right thing. Instead of picking up a month, or week, or even a day after last season's exciting ending, where MI-6 agent gone rogue Eve Polastri (Golden Globe winner – Sandra Oh), has gone to Paris and ended up stabbing her prey, the elusive and puzzling Russian assassin, Villanelle (Jodie Comer), the Season Two premiere picks up just 30 seconds later. Eve panicked to find that the wounded Villanelle has disappeared, frantically runs from the scene. And off we go! Yes! Killing Eve is back with a vengeance and if anything is better than ever. Still at its core is the superb writing filled with twists and turns worthy of any high-stakes psychological thriller. 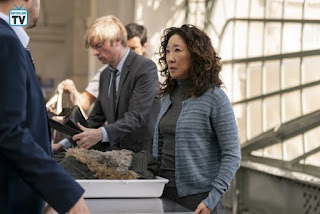 But what elevates this show to iconic status and makes it must-watch television are its stars, Sandra Oh and Jodie Comer and the unique chemistry they share in bringing the enigmatic characters they play to life. During the episode, Villanelle says, "Love makes you do crazy things," and never has there been a more on-point line of dialogue. 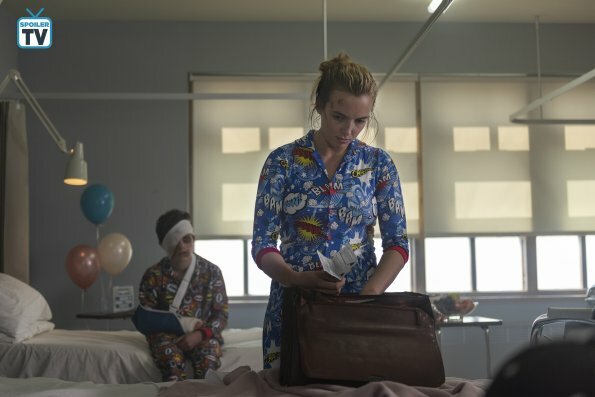 Among the least crazy things these two do during the premiere on BBC America and AMC, is have Villanelle make a pair of too small superhero pajamas look almost fashionable and Eve makes a new friend with the window salesman on the phone and likely single-handedly helps him make his monthly quota. These two amazing actresses have now had a season to get to know these characters and by their performances tonight will likely be showing us even more layers to Eve and Villanelle this season. 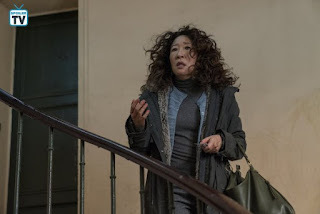 Sandra Oh has won the awards, but as she has so often mentioned in acceptance speeches, Comer is right there with her in being deserving of every accolade. At first, Eve is befuddled and panicked after stabbing Villanelle. She runs wildly down the stairs still carrying a bloody knife and even starts through security at the train station with the knife in her pocket. Then, of course, she would find it hysterical that a woman at the bar at the station would think her shaking hands and nervous behavior would indicate that she's a junkie. Much better to be a junkie than a woman that's just killed, someone. Back home she genuinely tries to make up with her husband, Nico (Owen McDonnell) by cooking him a nice chicken dinner. There's just one problem, she so shaken she chops up a ton of vegetables but forgets to put the chicken in the oven. Later in a scene that so brilliantly illustrates why Oh has won awards for playing this character, Eve begins to crack while soaking in a bathtub. 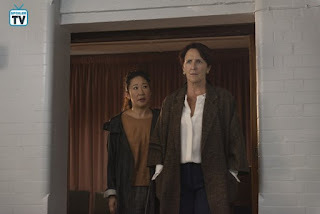 But it is when she finally answers one of the many phone calls from her former boss, Carolyn (Fiona Shaw) -remember Carolyn fired Eve- that Eve begins to regain control. After meeting with Carolyn and going with her to perhaps the most unusual morgue in the world and sharing a burger because the smell of formaldehyde apparently makes everyone crave meat there are glimpses of the in-control Eve. Carolyn has rehired her and presented her with a new challenge, the exhumed body of an internet mogul whom it has been determined has been murdered. Their first clue was a note with Eve's name on it left by Villanelle's fellow assassin, Nadia (Olivia Ross from Season 1), the only thing on the note was the name of the victim. Eve quickly determines that this isn't one of Villanelle's victims and just like that, just when she thought she was out Carolyn pulls her back in. 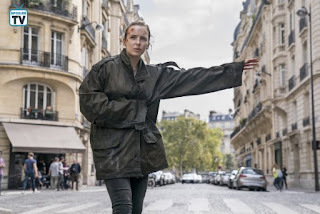 Carolyn also succinctly reminds her that if Villanelle is still alive, whether Eve works for MI-6 or not, the assassin is still going to come after her. If there is one thing to admire about Villanelle is that she's a survivor. Despite losing a lot of blood, she still has the presence of her warped mind to find a ride to a hospital by throwing herself in front of a taxi-cab. At the hospital, she befriends a young accident victim in her ward. And doing what she does best, Villanelle uses the disfigured young man to keep her identity a secret and begins planning her escape. She tells him that she must go to London to see her girlfriend, who stabbed her, whom she forgives and whom she says she knows better than that woman knows herself. And she just may be right. As a final act of what she must surely see as an act of mercy snaps the young man's neck after he says he wishes he'd died in the same car accident that killed his parents upon learning what his disfigured face looks like from Villanelle. She then makes her escape in his only clothing a pair of teen sized superhero pajamas, but not before revealing one more quirk about herself. To escape she needs shoes and shows a marked revulsion of putting her bare feet inside a pair of empty Crocs she finds at the nurses' station. Escaping the hospital, she stows away in the back of a family's mini-van and is soon on her way to London and her "girlfriend". The game is most definitely back on! This season it appears that, surprisingly, Eve stabbing Villanelle is only going to serve the bring these two women, who are more alike than either cares to admit, closer together. 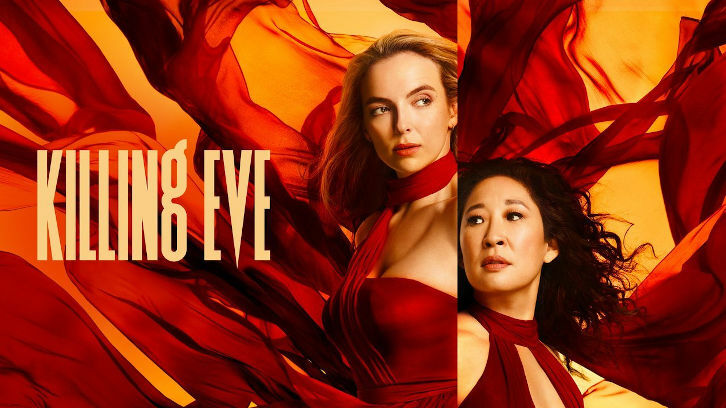 And the winner of their game of wits is most assuredly the fans of Killing Eve. Season 2 is off to a fabulous start and it's only going to get more intriguing as the season unfolds. What did you think of the Season 2 premiere of Killing Eve? What was your favorite line or scene? Discuss in the comments below.